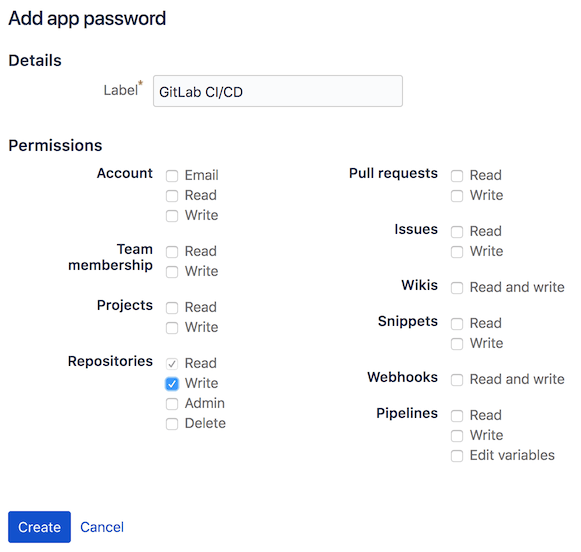 GitLab CI/CD can be used with Bitbucket Cloud by creating a CI/CD project and connecting your Git repository via URL. In GitLab create a CI/CD for external repo, select Repo by URL and create the project. GitLab will import the repository and enable Pull Mirroring. In GitLab create a Personal Access Token with api scope. This will be used to authenticate requests from the web hook that will be created in Bitbucket to notify GitLab of new commits. 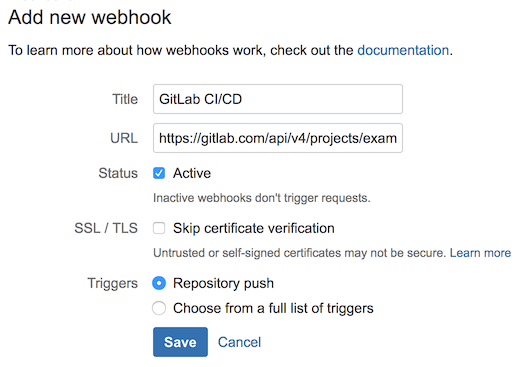 In Bitbucket from Settings > Webhooks create a new web hook to notify GitLab of new commits. The web hook URL should be set to the GitLab API to trigger pull mirroring, using the Personal Access Token we just generated for authentication. The web hook Trigger should be set to ‘Repository Push’. After saving, test the web hook by pushing a change to your Bitbucket repository. In Bitbucket create an App Password from Bitbucket Settings > App Passwords to authenticate the build status script setting commit build statuses in Bitbucket. Repository write permissions are required. In GitLab from Settings > CI/CD > Environment variables add variables to allow communication with Bitbucket via the Bitbucket API. In Bitbucket add a script to push the pipeline status to Bitbucket. Note: changes made in GitLab will be overwritten by any changes made upstream in Bitbucket. Create a file build_status and insert the script below and run chmod +x build_status in your terminal to make the script executable. echo "ERROR: BITBUCKET_ACCESS_TOKEN is not set"
echo "ERROR: BITBUCKET_USERNAME is not set"
echo "Setting BITBUCKET_NAMESPACE to $CI_PROJECT_NAMESPACE"
echo "Setting BITBUCKET_REPOSITORY to $CI_PROJECT_NAME"
echo "Pushing status to $BITBUCKET_STATUS_API..."
Still in Bitbucket, create a .gitlab-ci.yml file to use the script to push pipeline success and failures to Bitbucket. - echo "Success. Add your tests!" GitLab is now configured to mirror changes from Bitbucket, run CI/CD pipelines configured in .gitlab-ci.yml and push the status to Bitbucket.